When the rate of depolarization of the sinoatrial node falls below the rate of the atrioventricular node, a depolarization from somewhere in the AV node will occur; either as a single escape beat, or as a series of escape beats (escape rhythm). P-wave morphology depends on the site of the ectopic focus, will be inverted; and may appear before, during, or after the QRS complex. If the P-wave occurs before the QRS complex, the PR interval will be less than 0.12 seconds. 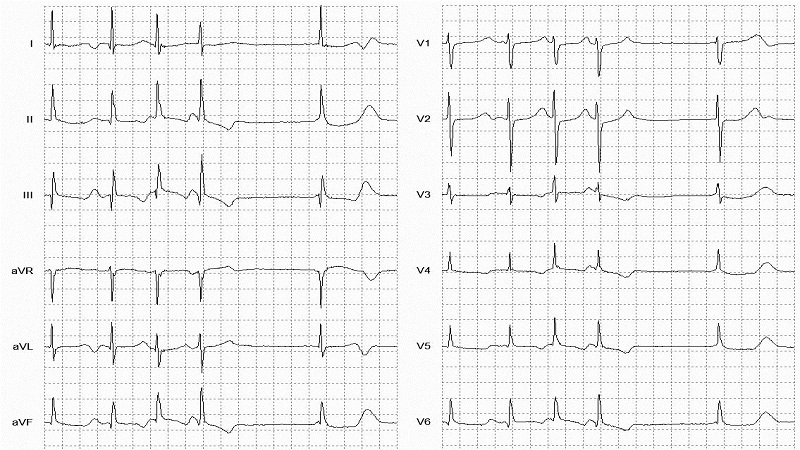 The QRS complex will usually be normal in duration and morphology.